Proprietary Name: Lotemax Sm What is the Proprietary Name? Non-Proprietary Name: Loteprednol Etabonate What is the Non-Proprietary Name? Lotemax Sm with NDC 24208-507 is a a human prescription drug product labeled by Bausch & Lomb Incorporated. The generic name of Lotemax Sm is loteprednol etabonate. The product's dosage form is gel and is administered via ophthalmic form. FDA Application Number: NDA208219 What is the FDA Application Number? Invert closed bottle and shake once to fill tip before instilling drops. Apply one drop of LOTEMAX® SM into the conjunctival sac of the affected eye three times daily beginning the day after surgery and continuing throughout the first 2 weeks of the post-operative period. LOTEMAX® SM (loteprednol etabonate ophthalmic gel) 0.38% is a sterile preserved ophthalmic gel containing 3.8 mg of loteprednol etabonate per gram of gel. LOTEMAX® SM, as with other ophthalmic corticosteroids, is contraindicated in most viral diseases of the cornea and conjunctiva including epithelial herpes simplex keratitis (dendritic keratitis), vaccinia, and varicella, in mycobacterial infection of the eye and fungal diseases of ocular structures. Prolonged use of corticosteroids may result in glaucoma with damage to the optic nerve, defects in visual acuity and fields of vision. Steroids should be used with caution in the presence of glaucoma. If this product is used for 10 days or longer, intraocular pressure should be monitored. Prolonged use of corticosteroids may suppress the host response and thus increase the hazard of secondary ocular infections. In acute purulent conditions of the eye, steroids may mask infection or enhance existing infection. Because clinical trials are conducted under widely varying conditions, adverse reaction rates observed in the clinical trials of a drug cannot be directly compared to rates in the clinical trials of another drug and may not reflect the rates observed in practice.Adverse reactions associated with ophthalmic steroids include elevated intraocular pressure, which may be associated with infrequent optic nerve damage, visual acuity and field defects, posterior subcapsular cataract formation, delayed wound healing and secondary ocular infection from pathogens including herpes simplex, and perforation of the globe where there is thinning of the cornea or sclera.There were no treatment-emergent adverse drug reactions that occurred in more than 1% of subjects in the three times daily group compared to vehicle. Risk Summary There are no adequate and well controlled studies with loteprednol etabonate in pregnant women.Loteprednol etabonate produced teratogenicity at clinically relevant doses in the rabbit and rat when administered orally during pregnancy. Loteprednol etabonate produced malformations when administered orally to pregnant rabbits at doses 4.2 times the recommended human ophthalmic dose (RHOD) and to pregnant rats at doses 106 times the RHOD. In pregnant rats receiving oral doses of loteprednol etabonate during the period equivalent to the last trimester of pregnancy through lactation in humans, survival of offspring was reduced at doses 10.6 times the RHOD. Maternal toxicity was observed in rats at doses 1066 times the RHOD, and a maternal no observed adverse effect level (NOAEL) was established at 106 times the RHOD. The background risk of major birth defects and miscarriage for the indicated population is unknown. However, the background risk in the U.S. general population of major birth defects is 2 to 4%, and of miscarriage is 15 to 20%, of clinically recognized pregnancies.DataAnimal DataEmbryofetal studies were conducted in pregnant rabbits administered loteprednol etabonate by oral gavage on gestation days 6 to 18, to target the period of organogenesis. Loteprednol etabonate produced fetal malformations at 0.1 mg/kg (4.2 times the recommended human ophthalmic dose (RHOD) based on body surface area, assuming 100% absorption). Spina bifida (including meningocele) was observed at 0.1 mg/kg, and exencephaly and craniofacial malformations were observed at 0.4 mg/kg (17 times the RHOD). At 3 mg/kg (128 times the RHOD), loteprednol etabonate was associated with increased incidences of abnormal left common carotid artery, limb flexures, umbilical hernia, scoliosis, and delayed ossification. Abortion and embryofetal lethality (resorption) occurred at 6 mg/kg (256 times the RHOD). A NOAEL for developmental toxicity was not established in this study. The NOAEL for maternal toxicity in rabbits was 3 mg/kg/day. Embryofetal studies were conducted in pregnant rats administered loteprednol etabonate by oral gavage on gestation days 6 to 15, to target the period of organogenesis. Loteprednol etabonate produced fetal malformations, including absent innominate artery at 5 mg/kg (106 times the RHOD); and cleft palate, agnathia, cardiovascular defects, umbilical hernia, decreased fetal body weight and decreased skeletal ossification at 50 mg/kg (1066 times the RHOD). Embryofetal lethality (resorption) was observed at 100 mg/kg (2133 times the RHOD). The NOAEL for developmental toxicity in rats was 0.5 mg/kg (10.6 times the RHOD). Loteprednol etabonate was maternally toxic (reduced body weight gain) at 50 mg/kg/day. The NOAEL for maternal toxicity was 5 mg/kg. A peri-/postnatal study was conducted in rats administered loteprednol etabonate by oral gavage from gestation day 15 (start of fetal period) to postnatal day 21 (the end of lactation period). At 0.5 mg/kg (10.6 times the clinical dose), reduced survival was observed in live-born offspring. Doses ≥ 5 mg/kg (106 times the RHOD) caused umbilical hernia/incomplete gastrointestinal tract. Doses ≥ 50 mg/kg (1066 times the RHOD) produced maternal toxicity (reduced body weight gain, death), decreased number of live-born offspring, decreased birth weight, and delays in postnatal development. A developmental NOAEL was not established in this study. The NOAEL for maternal toxicity was 5 mg/kg. There are no data on the presence of loteprednol etabonate in human milk, the effects on the breastfed infant, or the effects on milk production. The developmental and health benefits of breastfeeding should be considered, along with the mother’s clinical need for LOTEMAX® SM and any potential adverse effects on the breastfed infant from LOTEMAX® SM. Safety and effectiveness of LOTEMAX® SM in pediatric patients have not been established. Loteprednol etabonate is a corticosteroid. Corticosteroids have been shown to inhibit the inflammatory response to a variety of inciting agents. They inhibit the edema, fibrin deposition, capillary dilation, leukocyte migration, capillary proliferation, fibroblast proliferation, deposition of collagen, and scar formation associated with inflammation. While glucocorticoids are known to bind to and activate the glucocorticoid receptor, the molecular mechanisms involved in glucocorticoid/glucocorticoid receptor-dependent modulation of inflammation are not clearly established. However, corticosteroids are thought to inhibit prostaglandin production through several independent mechanisms. The pharmacokinetic exposure to loteprednol etabonate following topical bilateral ocular administration of one drop three times daily of LOTEMAX® SM for up to two weeks (Day 15) was evaluated in 18 healthy adult subjects. Plasma concentrations of loteprednol etabonate were analyzed using a validated LC/MS/MS method and the lower limit of quantitation for loteprednol etabonate was 0.05 ng/mL. The mean (± SD) Cmax values for loteprednol etabonate in plasma were 0.13 (± 0.06) ng/mL on Day 1 after a single dose and 0.16 (± 0.06) ng/mL after the last dose on Day 15 of the study. The mean (± SD) AUCt values for loteprednol etabonate in plasma were 0.15 (± 0.15) hr•ng/mL on Day 1 after a single dose and 0.35 (± 0.32) hr•ng/mL after the last dose on Day 15. Long-term animal studies have not been conducted to evaluate the carcinogenic potential of loteprednol etabonate. Loteprednol etabonate was not genotoxic in vitro in the Ames test, the mouse lymphoma tk assay, or in the chromosomal aberration test in human lymphocytes, or in vivo in the mouse micronucleus assay. Treatment of male and female rats with 25 mg/kg/day of loteprednol etabonate (533 times the RHOD based on body surface area, assuming 100% absorption) prior to and during mating caused preimplantation loss and decreased the number of live fetuses/live births. The NOAEL for fertility in rats was 5 mg/kg/day (106 times the RHOD). LOTEMAX® SM (loteprednol etabonate ophthalmic gel) 0.38% is a sterile ophthalmic submicron gel supplied in a white low-density polyethylene plastic bottle with a white controlled drop tip and a pink polypropylene cap in the following size: 5 g in a 10 mL bottle (NDC 24208-507-07)Use only if imprinted neckband is intact.Storage: Store upright at 15º to 25ºC (59º to 77ºF). 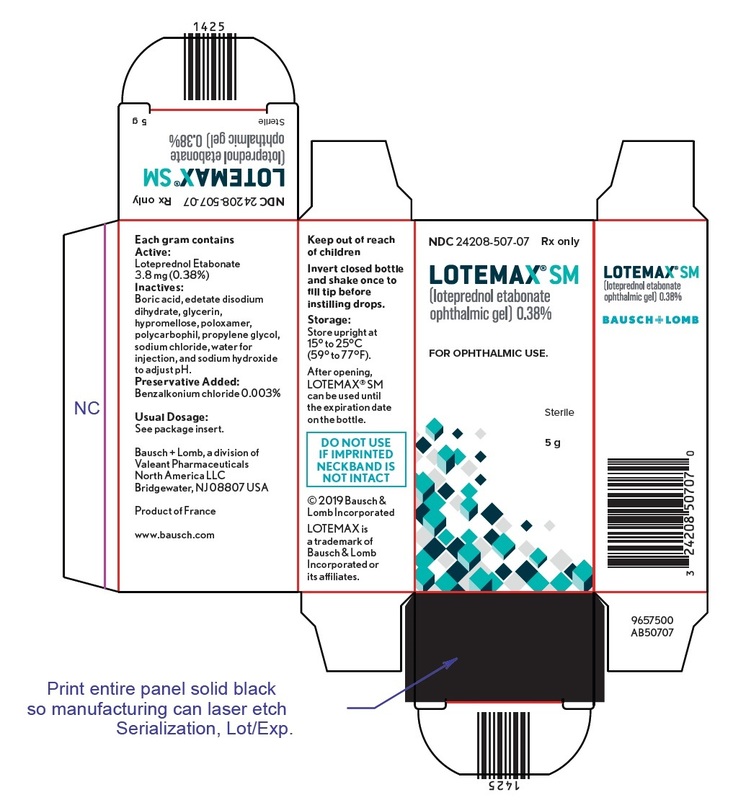 After opening, LOTEMAX® SM can be used until the expiration date on the bottle.